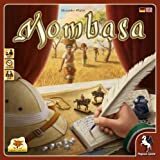 If you use a reward that allows you to move forward on a specific track and you cannot use it completely (because of a capital call which you cannot pay or the end of the track), move your marker as far as possible (if at all) and forfeit the rest. Each company track has 2 special spaces. As soon as you reach or pass such a special space with your track marker, you immediately receive from the bank the number of pounds depicted above the special space (1 or 2). Important: Each player that reaches or passes a special space receives the depicted amount. However, when he reaches or passes it, all players who already reached or passed that space before that player also receive the depicted amount from the bank yet again. Example: Blue moves 2 spaces forward on the track and passes the first special space. For this, he immediately receives 1 pound from the bank. Since Green and Yellow already have reached that special space before Blue, they also receive 1 pound each from the bank yet again. As soon as you reach or pass a special space, you also unlock its special track bonus. 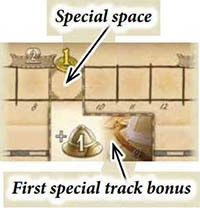 'I his special track bonus will take effect from your next turn onward (i.e. if you unlock it in the middle of an action, you cannot use this bonus while still carrying out that action). There are 2 types of special track bonuses: Permanent bonuses and extra bonus spaces. Permanent bonuses can only be found on tracks A and B, while the extra bonus spaces can be found on tracks C and D. If you have unlocked a permanent bonus, you may use it each time you perform an action for which the bonus is relevant. Extra bonus spaces work exactly like the bonus spaces on the game board (i.e. you use them with the "Place 1 bonus marker" action). Each track has 2 special track bonuses. 'The second special track bonus of any company track usually is an improved version of the first one. Important: If you have managed to unlock the second special track bonus of a company track, you are entitled to EITHER use that second OR its first special track bonus, but you may never use both. 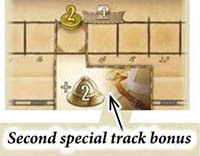 In the case of the permanent bonuses this means: 'I he first and second special track bonuses of a track are never cumulative. In the case of the extra bonus spaces this means: Each round you may only use one of the bonus spaces of that track. 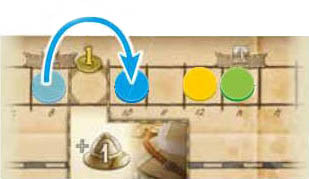 So, if one of your bonus markers is already on one of the two bonus spaces, you are not allowed to place a second marker onto the other. Your total expansion value in your action area is increased by 1 or 2 for all intents and purposes (expanding a company, majority bonus spaces, book requirements, etc).. However, this bonus takes only effect if you have at least 1 expansion card in your action area. You have 1 or 2 additional bonus markers of your color which you can place as usual. (Take these bonus markers from the ones that where returned to the box during setup). Each time you acquire a card from the card display by using banana goods cards as a payment, the card price is reduced by 1. Each time you acquire a card from the card display using goods cards, the card price is reduced by 1. As a payment for that card you may even use different types of goods cards (and then use any excess units to advance on company tracks). Each time you acquire a card from the card display by using cotton goods cards as a payment, the card price is reduced by 1. The unit value of each cotton goods card in your action area is increased by 1 for all intents and purposes. (this applies to each cotton card, not just the total unit value of cotton). Requirement: Pay to the bank the number of pounds shown. Reward: Immediately use 1 bookkeeping point AND move 2 spaces forward with your diamond marker on your diamond track. OR: Use 2 bookkeeping points AND move 1 space forward on your diamond track. Reward: Immediately use 2 bookkeeping points AND move 2 spaces forward on your diamond track. Reward: Immediately buy 1 card from the card display by paying its entire card price in pounds to the bank (take the card into your hand) AND/OR move 1 space forward on your diamond track. Reward: Immediately buy 1 card from the card display by paying its card price (reduced by 1) in pounds to the bank (take the card into your hand) AND/OR move 2 spaces forward on your diamond track. Requirement: Remove 1 card from your hand by placing it face up onto the action card discard pile. Reward: Immediately take a number of pounds from the bank equal to the red crate-value of the removed card + 3. Requirement: Remove 1 coffee goods card from your hand by placing it face up onto the action card discard pile. Reward: Immediately take a number of pounds from the bank equal to the red crate-value of the removed card + 8. Requirement: Pay 1 pound to the bank. Reward: Immediately move your track markers on 2 different company tracks (other than track D2) 2 spaces forward each. Reward: Immediately move your track markers on each of the other 3 company tracks (excluding track D2) 2 spaces forward.